Here can people post about their idea’s about monster you like to see in Evolve. P.S this is just an exsample what you can post here, and maybe the Devs wil like them and maybe make them and throw them in to the game ;). Let's talk new monster ideas. We can't have too many! How well will the forums receive fan-made ideas? Ability nr.2: Grab - Info: Hugely useful power, taking an enemy out of the fight is a big deal. Can target left claw to force a drop. Left claw takes less damage - has tons of armor, ex. Ability nr.3: Venomous Spray - Info: Slows, poisons and adds a disorienting screen effect. Ability nr.4: Undecided - Info: Brainstorm up a couple and we will try and make a complete monster. Not sure on what evolution have to do with powers strength/utility so I left that for others to think about. Do you think you can make a concept art of the monster? Possibly, though it will not be amazing for I only dabble in drawing. I’ll get back to you on that. -Like a centipede body and legs. -Only while still will it make a noise of the last animal it consumed (including human). -Is VERY VERY SCARY TO SEE UP CLOSE (like super scary, to the point its almost like a horror film just to see or be stalked by this thing). -Has noise vision, if something makes a noise it can be seen. -Can evolve to see “Silence”. -Hard body, with face as only real weak spot (and legs). -Can climb tree trunks in spiral fashion, or would be to much stress on rest of body just climbing straight up. -AGAIN IT CAN CLIMB AND MOVE IN COMPLETE SILENCE!!! (does not give off any thermal energy as well since it has a dark insulating shell on its body (its face may be seen). -Bush’s with frogs or birds that can be eaten (so that if a person hears frogs croaking in a bush… it could be a frog…or it could be Owe). -During the night if an animal is asleep and the hunter wakes it up, the animal should be startled. Pro’s and Cons’ of Owe! -Only can attack with spear like tongue which is located on it’s face…where it is weakest… (may add weak ranged attack that poisons over time or something to help make it more fun to play). -Can only see things that are making noise and (normal site possibly)… if something is silent than it can not be seen. -Might be difficult to play if can’t get good feed early game. That one sounds like a scary nighmarish centipede that you dont want to mess with. Got to say I am a lover of the weird senses mechanic, truly hope they at least one monster of this type. Not maybe as a centipede, though I am not complaining. The reason why I named the monster “Owe” was for when people figure out who they are fighting, I wanted to imagine them going “ohhhhh” and than hopefully a great feeling of terror would then fill their body. I also wanted this monster to have an ability that most games keep leaving out, and that is terror it self. I miss those moment when you think to yourself that everything going to be fine and then something jumps out at you on screen and you start to make your character run away for no other reason but because you are scared and you want support and safety. I want this monster to instill a sense of danger that can be passive and unpredictable. I mentioned above that I thought of adding a slow poisoning feature to his/her attack which would be like a single use slow kill. So, at first no one would notice that the person has been poisoned, until the player (who is poisoned) starts to notice that their screen is getting a bit fuzzy and they can hear the breath of their character (btw don’t forget the more noise someone makes, the more the monster can SEE). So this poison is un-curable they can find plants and other things to treat it as a quick fix but once you are poisoned (which can only happen once per an evolution), than there is no escaping death. I haven’t put much thought into the skills, or stats, or what you can evolve per an evolution but if I do I want to put the time to really perfect the idea. So? what you guys think? Side note: I’m super glad that the people here, so far, are constructive and open to ideas! you all rock! not to be rude, but can you please type that in english? EDIT: the reason is because people do not understand what you write and most of forums, people must type it in English no matter what country they are from. If you can english then use google translate or something but anyway i can be nice to just translate it for you :). Hey, please dont use harsh language on the forum, some forum will ban people that are using harsh language. This forum i’m guessing every post on this forum is english required, but i cant confirmed it 100% so @Chloe or @SlabOMeat can comfirme if it is allowed to post other languages then English on this Forum, but in my own opinion i think it is much easier to have it only english cause most of other countries have their main language and English as secondary language. okey…why should you be ashamed that you are Brazilian? It doesnt matter what country your from, but i still prefer english on the forum, cause that my secondary languages, so i wont understand other languages then english and i will just scroll down or ignore other post in a different languages ( no offense). toxic spines, it would work like a mine and affects would be triggered when stepped on. poison damage over time along with a tracking odor…like the way a komodo dragon bites its victims and trails it till it dies. Charge, the monster would charge in a zig zag pattern and latch on swinging the hunter as a weapon or throwing them into the air. toxic fumes that works like a poisonous spray from the mouth or is excreted though pores on its body. ability 1: releases swarm would get more numbers higher lvl and can be used in combat to help dps and take some dam from the monster and can also be used out of combat to set traps such as players following prints come across them and while Legion prepares a pounce or leap in but are easy to kill. ability 2: drops some young that attache to any enemy that gets close to them then explode leaveing acid on the enemy that does damage over time plus that dam it does from exploding. ability 3: a spray (web or mucus) that catches anything in a cone and pulls it to Legion useful in pulling creeps to you and immobilizing them for a littile useful for feeding can also be used on hunters (can catch all hunters in front of you if not positioned around monster) to stop them for a sec or pull them in to get a quick hit or two in or into your young. ability 4: swings his tail around him knocking back all enemy’s and poisoning them. the idea behind the use of this monster is deception and damage over time i see that goliath is up in your face where kraken is ranged skill shots where legion would be a hit and run leaving nasty surprises to any care free hunter and makeing there hit points drop over a time also he would need to be pretty quick with decent armor (not sure if different monsters get different armor values)but little health. I’m really liking this creature idea…did you photoshop that? Perfect name for something like this featuring a spawn ability. 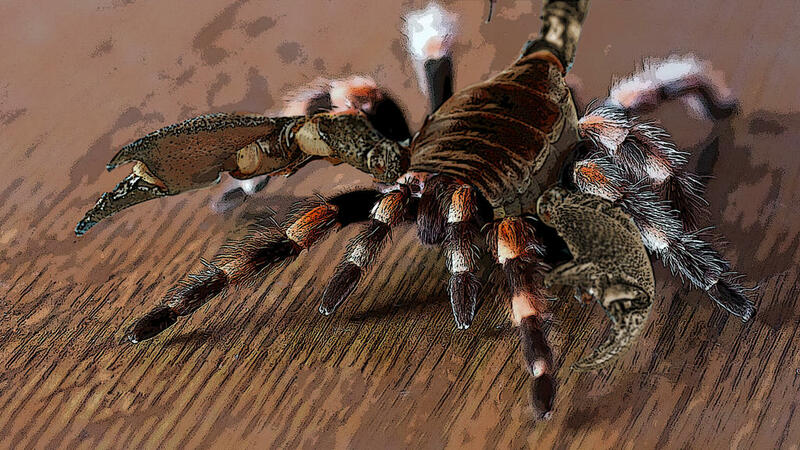 Spiders can also rear up when attacking, which would work well with dropping a swarm of little 'uns from the belly region…although scorpions also can carry young on their back. This could work as a direct attack to the hunters during a fight…but also in ability #2. Drop some sacs of young that explode when the hunters get near. These young attack the hunters in a similar way to how the Kraken’s banshee mines work. Would be nice to leave in caves, especially around Trapjaws or area wildlife aggro to hunters. Ability #3…I like the idea of being able to incap a single hunter in a web…but this may be a little OP if the creature can then pull it towards them to eat. This would need a pretty big cooldown I’d imagine but would be a very nice weapon pulled off well. I imagine incapping Laz in a web as soon as the dome comes down. The web could also be used in a wide burst to slow down/trap all hunters in range at once but they would be able to get free after a few seconds…good get-away quick or bog-down tool. Of course ability#4 good use with a scorpion tail, with a cinematic chest stab with the stinger for an already weakened/dying hunter. Mind if I sketch this bad boy out? I am actually hoping for an arachnid type Monster next! Here’s hoping, eh? Would be really cool to see you sketch that monstrosity!